A little while back I discovered Lovea Bio organic shampoo with argan oil so I was really excited to get the chance to try out some of their body care products. 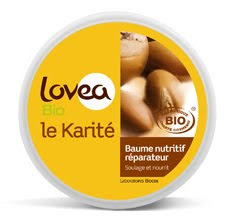 The Lovea Bio Burkina Shea Nourishing Body Balm costs £6.49 from mypure.co.uk and is a sizable tub. The body cream is quite rich so you don't need to use very much. The balm is wobbly to touch but kind of melts into your skin upon use so it absorbs well and doesn't leave me feeling sticky. The smell of shea butter is very strong yet comforting. For an organic, paraben-free body lotion, I'm quite impressed. It is the first paraben-free body lotion that I've tried for adults (I've tried plenty for Lara). In terms of its effectiveness as a moisturising body balm, I'm still undecided about whether I would buy this product again. The Lovea Bio Argan Oil Cell Renewal Body Scrub is scrumptious. I love the effect of the Argan oil on both my hair and body – it leaves me feeling silky and soft! This body scrub is incredibly effective, and rates up there with my current favourite (non organic, non paraben-free) Clarins bamboo scrub. The scrub is made with small pieces of sugar and orange peel which makes for a great exfoliant for use a couple of times a week. My only complain with this product is that I struggle to get it out of the tube! The chunky bits get stuck in the opening which means you have to squeeze REALLY hard to get any out. Next time you try, the opening is unblocked and it takes you by surprise, causing it to squirt all over the bathroom. Note to self... don't point the tube towards your face when trying to remove the blockage. The Lovea Bio Argan Oil Cell Renewal Body Scrub costs £7.49 from mypure.